The landmark Union Station, located on the eastern edge of downtown Los Angeles, is an impressive sight. The structure fuses the Spanish colonial, Art Deco and streamline Modern Architecture that represent California's heritage and future ambitions. Traxx is where the romance of the past and the spirit of the future seamlessly merge. Since 1997, Traxx has brought fine dining back to historic Union Station while acting as major player in Los Angeles' downtown renaissance. Its presence, along with the Staples center and the revitalized shopping and cultural venues, adds extra vitality to the cityscape. Even with modern Los Angeles blossoming in its midst, Traxx's ambience recalls the glamour and wonder of train travel's golden era. Do you enjoy travel, art deco and a sense of adventure? Well then, don’t let this downtown delight pass you by. Traxx is located in Union Station, a beautiful building that was completed in 1939 and stands as a testament to a simpler, more romantic era when people took the time to experience the day. The restaurant is the creation of Chef Tara Thomas, who built it on the site of Union Station’s old newsstand. With 120 seats including a romantic back patio, Traxx is a unique dining destination. Bring an appetite, enjoy the architecture, and step back in time. Our evening began with a selection of appetizers. The light and refreshing Waldorf Salad, with thinly sliced apples, spiced walnuts, and small nuggets of Pt. Reyes Blue Cheese, awakened our palate for the journey to come. The Seared Maine Diver Scallops with Warm Bloomsdale Spinach, Applewood Smoked Bacon Vinaigrette and Blood Orange Gastrique—a mouthful to write—delivered juicy goodness to our taste buds and frontal lobes. If you enjoy scallops as much as I do, then this sweet and slightly tangy offering will get your attention. You haven’t tasted scallops like these before. The Prince Edward Island Mussels in Spicy Tomato Saffron Broth were kindly escorted by Sardinian couscous. This dish was a spicy treat. The plump, juicy mussels were cooked to perfection and proceeded to burst with flavor. And hey, I didn’t even know that Sardinian couscous even existed, let alone tasted this good. If you enjoy spicy fare, then this is the choice for you. But if your eating window is brief and allows you only one Traxx appetizer, then it has to be the Louisiana Jumbo Lump Crab Cake with Chipotle Chili Remoulade. Now, I’m from the East Coast, I grew up with crab cakes, and let me tell you, this huge crab cake was plump, juicy and delicious. Cocktail sauce is usually the crab cake topping of choice, but Chef Thomas’s chipotle chili remoulade was a wonderful departure from tradition. It also came topped with a small offering of salad with a delightful lemon vinaigrette. I could go back, pay the valet (which is actually complimentary) and order two of these beauties right now. This is the only crab cake in Los Angeles that hasn’t left me with East Coast hunger pains. All aboard for the main courses! This country boy loved the Wild Virginia Striped Bass with caramelized fennel and coriander vinaigrette. The bass was light and flaky, and the fennel and sautéed spinach complemented it well. The beauty of this dish is in the simplicity of its execution. Chef Thomas also uses fennel in the Fennel Scented Prawns with Asparagus Risotto. This dish came with shiitake mushrooms and English peas. The vegetables were remarkable: the asparagus was crisp and the mushrooms are tender. But wait, what about the prawns? They were fabulous: lightly dusted with coriander, white pepper and, of course, fennel. Now here is something that you don’t eat every day: Miso Marinated Hanger Steak. I had never tried miso steak before, but let me tell you, it was unique. The flavor was sweet and earthy, lighter than teriyaki but with an aftertaste like mesquite barbecue. Chef Thomas marinates the meat for twenty-four hours in red miso. It is a must-try. This entree also came with baby bok choy, shiitake mushrooms and sugar snap peas. Those peas aim to please. I could eat a whole plate of them. Both my dining partner and I were very impressed. I also completely devoured my baby bok choy. 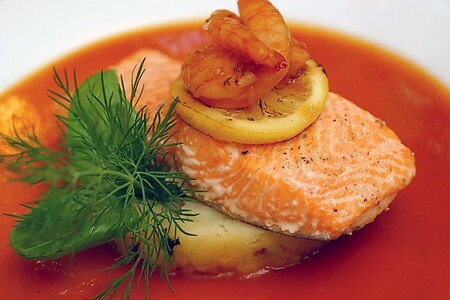 But ladies and gentlemen, madames and messieurs, my favorite entree was also the newest Traxx menu addition: the salmon. The Wild Alaskan White King Salmon with baby artichokes, asparagus, hearts of palm, nicoise olives, and charred tomato vinaigrette is worth the drive in bumper-to-bumper traffic. This fish was delish: crispy on the outside, delightfully moist and tender on the inside. It burst in our mouths with a unique fruity flavor. The tomato vinaigrette should be bottled and sold, or perhaps traded on the NYSE. The asparagus was crisp and the olives, artichokes and hearts of palm are exceptional. The seafood and vegetables at Traxx never disappoint. Then they rolled out dessert. My two favorites were the Crunchy Chocolate Praline Torte with Espresso Crème Anglaise and the Lemon Curd Tart with Raspberry Coulis. The chocolate praline torte was a creamy flourless creation with a delightfully crunchy exterior. I should have taken one for my trip back to the Westside. And pucker up for the Lemon Curd Tart. If you love sweet-sour, then this light and breezy dessert will deliver the goods. We had the house wine, which is a 2003 Phillipe Lorraine Chardonnay: smooth and dry with notes of apple and lemon. We also sampled the Meritage Double T 2002, a clean-finishing red with notes of blackberry. Both offerings perfectly complemented our seafood and meat entrees. If you work downtown or are traveling out of Union Station, make some time for Traxx. The wait staff is all smiles and they really do their best to provide you with a pleasant dining experience. Chef Thomas has created something special. Come along for the ride. This is Matt, The Food Dude™, and here’s to your journey through the day. Main Dining Room | Lunch 11:30 a.m. - 2:30 p.m.
Main Dining Room | Dinner 5:30 p.m. - 10 p.m.
Main Dining Room | Dinner 5 p.m. - 9:30 p.m.
What building are you located in? Who is your Executive Chef? How long has this restaurant been open? Traxx has been open since 1997. We had our wedding in the courtyard by Traxx, and the event was hosted by and catered by Traxx. When we went in for the tasting the food was excellent and were pleasantly surprised that the quality of food did not decline at all for a large event of about 125 guests. The service was excellent, all the food was served hot and fresh to everyone's table. Everyone had complimented us on the food, and when we walked by everyone's table, sure enough everyone had finished every morsel of food on their plates. The restaurant was very accomodating and easy to work with. I highly recommend this place for any type of event. Enjoyed the setting and service was. Outstanding! I had my office holiday dinner at Traxx. They are closed on Sunday but opened up to accomodate our group. There was 28 of us. The service was ok, but the food was not. About half of my guests had to send their food back. Everything was COLD and the meat was not cooked. I myself had to send mine back twice and still never got to eat it. It was still raw. Because of this, there were some guests having desert, some still didnt have the entree. Also, with a group you have to pre-order your meals. DONT make any changes. I need to exchange one beef for one chicken and it was a major issue. They wanted to charge $48 for this change. The bathroom wasnt clean and you had to use toilet seat covers to dry your hands. If you need a place to host a party or just an intimate dinner, you should probably look elsewhere.